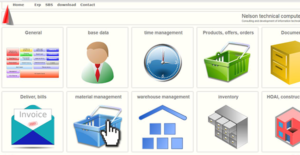 Open Source ERP is a free, open source Enterprise Resource Planning (ERP) solution that is distributed under the GNU Affero General Public License (APGL) regulations. It is a scalable software that runs well on multiple architectures and features a web interface designed for all the popular web browsers on Linux, Windows, Mac, iPad, and iPhone devices. The platform adopts a powerful modular structure that makes it suitable for small businesses with more than one person or medium-sized companies with a few hundred employees. Its mode of operation permits users to individually tailor the system to favor the processes in their companies. Some of its main modules include parts management, inventory management, scheduling, delivery & settlement, time & attendance, warehouse management, document management, products & offers, and orders. Open Source ERP comprises several modules that can be combined and tailored to form a comprehensive ERP system based on your individual business needs. Each module is designed to handle specific needs with the freedom to extend it with a reliable mail archiving plugin to support automatic mail, contact, offer, and order assignment. The Caldav or Carddav interface offers access to the required modules to export contacts that can be used in numerous calendars or address books. In addition, Open Source ERP offers a flexible window layout that can be adapted to the respective modules with ease. The layout presents a selection area that allows you to select items through a search entry or a building structure. It features selection tabs that show various sorting criteria such as mine or mine by category. The display areas can be defined to present data either in a tabular or form structure. The platform also features impressive sliders that allow you to enlarge or reduce an individual area. Better still, the Open Source ERP software features an integrated report writer. This tool allows you to utilize the database queries used in the ERP solution to generate comprehensive reports. It eliminates the expensive and time-consuming searches for database query errors experienced when using external reporting programs. Additionally, it easy to print invoices or product offers using Open Source ERP. The solution generates a PDF document which can be printed through a PDF display such as Adobe Acrobat Reader with ease. Since the visualization of the PDF documents is a standard installation of your web browser, it requires no additional installation to print. There are well-liked and widely used systems in each software category. But are they necessarily the best fit for your organization’s special needs? A trendy software product may have thousands of users, but does it offer what you need? For this reason, do not blindly invest in popular systems. Read at least a few Open Source ERP reviews and mull over the factors that you desire in the software such as the cost, main tools, available integrations etc. Then, shortlist a few solutions that fit your needs. Try out the free trials of these products, read online opinions, get explanations from the vendor, and do your investigation thoroughly. This profound homework is certain to aid you find the best software solution for your firm’s special requirements. How Much Does Open Source ERP Cost? Open Source ERP is a free software and for this reason, it doesn’t publish an enterprise pricing structure. We realize that when you make a decision to buy ERP Software it’s important not only to see how experts evaluate it in their reviews, but also to find out if the real people and companies that buy it are actually satisfied with the product. That’s why we’ve created our behavior-based Customer Satisfaction Algorithm™ that gathers customer reviews, comments and Open Source ERP reviews across a wide range of social media sites. The data is then presented in an easy to digest form showing how many people had positive and negative experience with Open Source ERP. With that information at hand you should be equipped to make an informed buying decision that you won’t regret. What are Open Source ERP pricing details? What integrations are available for Open Source ERP? If you need more information about Open Source ERP or you simply have a question let us know what you need and we’ll forward your request directly to the vendor.